[157 Pages Report] The Internet of Things (IoT) device management market size is expected to grow from USD 693.4 Million in 2017 to USD 2,559.6 Million by 2022, at a Compound Annual Growth Rate (CAGR) of 29.8% from 2017 to 2022. The main objective of this report is to define, describe, and forecast the IoT device management market on the basis of solutions, services, organization sizes, and deployment models, along with applications, and regions. The report provides detailed information regarding the major factors influencing the growth of the market (drivers, restraints, opportunities, and industry-specific challenges). The report also attempts to forecast the market size with respect to 5 main regions, namely, North America, Europe, Asia Pacific (APAC), Middle East and Africa (MEA), and Latin America. It profiles key players and comprehensively analyzes their core competencies. This report also tracks and analyzes competitive developments, such as joint ventures, mergers and acquisitions, and new product developments in the market. The IoT device management ecosystem comprises vendors providing IoT device management solutions to their commercial clients across the globe. Companies, such as Microsoft Corporation (US), PTC Incorporation (US), Telit Communications PLC (UK), IBM Corporation (US), Oracle Corporation (US), Smith Micro Software, Inc. (US), Advantech Co. Ltd. (China), Aeris (US), and Zentri (US) have adopted new partnerships, agreements, and collaborations as their key strategies to enhance their market reach. This strategy accounted for the largest share of the total strategies adopted by the market players. These IoT Device Management Solutions Vendors are rated and listed by us on the basis of product quality, reliability, and their business strategy. Please visit 360Quadrants to see the vendor listing of IoT Device Management Solutions. MarketsandMarkets forecasts the IoT device management market size to grow from USD 693.4 Million in 2017 to USD 2,559.6 Million by 2022, at a Compound Annual Growth Rate (CAGR) of 29.8%. The growing proliferation of connected devices, advent of sensors, and need for a convergent IoT device management platform are some of the driving factors for the growth of Internet of Things (IoT) device management market. 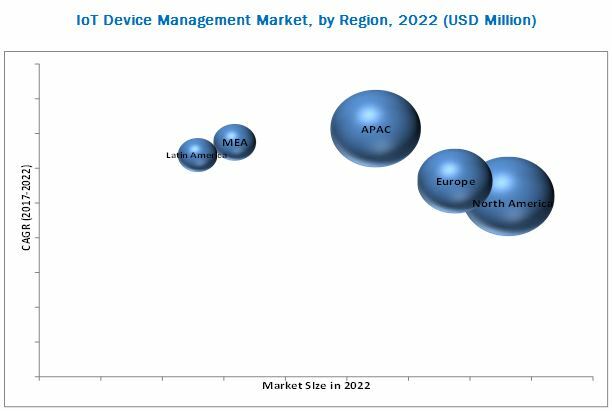 The IoT device management market is segmented by solution, service, organization size, deployment model, application area, and region. The service segment is expected to grow at a higher CAGR during the forecast period, because services help organizations to easily deploy the software on cloud. The services segment is further categorized into professional services and managed services. Furthermore, the professional services segment is classified into consulting service, support and maintenance, and integration services. The integration service segment is growing at a rapid pace as compared to the other professional service segments, owing to the lack of standardization and increase in diverse protocols, and connectivity technologies and devices. The security solution is the fastest growing in the IoT device management market, as security concerns are increasing among clients who are deploying IoT solutions. As numerus devices are connected to each other in an IoT system, the security of data becomes complex due to the non-standardization and non-compatibility of devices. Additionally, it is easier for hackers/attackers to perform malicious activities due to such varied protocols, applications, and devices. Thus, IoT solution vendors are investing large capitals in Research and Development (R&D) of security solutions, as security is also one of the major challenges faced by organizations while deploying IoT solutions. The hybrid cloud deployment model is expected to grow at the highest CAGR during the forecast period. It helps reduce the overall cost, while providing highly flexible and scalable access to the clients. The vendors are providing hybrid cloud-based deployment model to reduce the infrastructure cost for the clients. Security remains a critical issue that restricts its adoption; however, this issue is gradually being eradicated through rigorous security tests of highest standards by third parties. The Small and Medium-Sized Enterprises (SMEs) segment is expected to grow at the highest CAGR in the IoT device management market during the forecast period. Organizations with an employee range between 100 and 1,000 are categorized under SMEs. SMEs face some specific challenges, such as requirement of domain-specific technical personnel and skilled workforce, budget constraint, and limited economies of scale. The increasing competition has prompted SMEs to invest in this disruptive technology and adopt go-to-market strategies to make efficient decisions for the business growth. The application area segment is categorized into smart manufacturing, connected logistics, smart utilities, connected health, smart retail, and other segments. The IoT device management solutions are widely used in production, procurement, and storage of goods/materials, owing to which, the smart manufacturing application area is expected to dominate the IoT device management market. North America is expected to hold the largest market share and Asia Pacific (APAC) is growing at the highest CAGR in the market, however Middle East and Africa (MEA) and Latin America are still in their initial phase of introduction. The lack of Information Technology (IT) infrastructure and finance are some of the major factors restraining the growth of IoT device management in these regions. North America is estimated to hold the largest market share and expected to dominate the IoT device management market from 2017 to 2022. This region has the major dominance with sustainable and well-established economies, empowering the region to strongly invest in Research and Development (R&D) activities, thereby contributing to the development of new technologies in IoT security and analytics. Further, the government’s support and heavy investments by various well-established organizations are driving the growth of the market in the North American region. APAC has witnessed the highest CAGR in the IoT device management market, owing to the dynamic adoption of smart cities and the increasing investment by government toward IoT initiatives. Countries, such as Japan, China, Singapore, Australia, and India are gaining traction and taking various initiatives, in terms of R&D and supporting IoT deployments in utilities, and manufacturing and retail. Despite the rapid adoption of IoT device management in various application areas, the continuous exposure to security issues and lack of standardization are some of the challenging factors for the growth of this market. The IoT device management market is rapidly gaining traction, which is evident from the recent developments, new product launches, and acquisitions by the major market players, such as IBM Corporation, Microsoft Corporation, PTC Inc., Oracle Corporation, and Cumulocity GmBH. The market study also measures and evaluates the offerings of key vendors in the market, along with vendors who are offering highly innovative offerings, such as Xively, Particle, Einfochips, and Wind River Systems. 14.10 Smith Micro Software, Inc.